.... 1886 (125 years ago today), near the Arizona-New Mexico border, his own forces depleted after having battled for his homeland for nearly 3 decades, Geronimo surrendered to U.S. troops. The then-57-year-old Apache leader was the last Native American warrior to quit the fight, "signaling the end of the Indian Wars in the Southwest." Born and raised in what is now Arizona and Mexico, Geronimo had long launched and endured raids by settlers and troops in both countries. The U.S. removal of his people to an Arizona reservation where conditions were "restrictive and harsh" spurred more resistance. 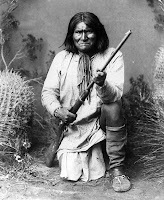 They fled in the 1880s, pursued by the U.S. Army, to which Geronimo surrendered on this day. (credit for 1887 U.S. Department of Defense photo of Geronimo) A prisoner of war, he would die at a reservation in Oklahoma in 1909. The United States' use of his name for the 2011 operation that killed Osama bin Laden prompted a Senate committee inquiry.